This is a unique billet aluminum CNC manifold. Kit ensures no more ripped carburetor boots. Protects case from chain breakage. Light weight billet design. Helps prevent bunching of the chain. 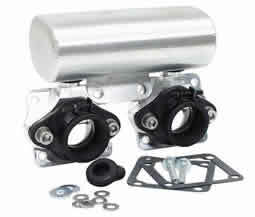 Manifolds include a large volume boost bottle rubber carburetor boots,and a reed valve air flow diverter to increase air speed by reducing turbulence in the reed cage. 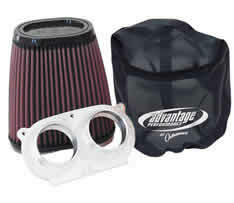 This metal filter replaces the standard restrictive filter, allowing a greater airflow into your engine. Has better airflow than foam filter but does not offer as good filtration. Includes billet base plate, which dramatically improves performance by directing and channeling airflow at a higher volume for superior power gains. It also includes outerwears cover for extra filtration and therefore engine protection. 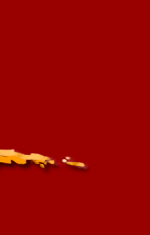 Positive o-ring seal provides an absolute barrier against sand and debris. This kit can save hundreds in engine repairs. In dry riding conditions, with the Pro Flow Kits, you can completely remove your air box lid and maximize your air intake. Your filter can now remain in place without the restriction inherent with the stock-mounting lid. 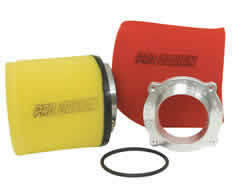 This kit replaces the standard restrictive filter with one that will allow more air to be sucked into your engine. Includes billet base plate, which dramatically improves performance by directing and channeling airflow at a higher volume for superior power gains. Positive o-ring seal provides an absolute barrier against sand and debris. This kit can save hundreds of pounds in engine repairs. In dry riding conditions, with the Pro Flow Kits, you can completely remove your air box lid and maximize your air intake. Your filter can now remain in place without the restriction inherent with the stock-mounting lid. Designed to slow water flow, which keeps water in the system for longer for better cooling. 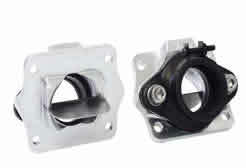 Billet aluminum construction is much more durable than stock plastic that breaks or melts apart. 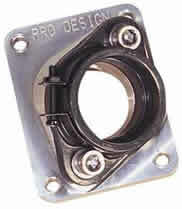 CNC machined for precise fit. Allows adjustment of the spark from 10 degrees of advance to 10 degrees of retard. Machined from 6061-T6 Aluminum, bolts on in minutes. Designed to mount onto the handlebars. The #1 quality lanyard kill switch used by professionals, required for racing and will protect your expensive quad from unnecessary damage in the case of accident. Hook your Kill Switch to your wrist with this universal fitting wrist band. Secures with velcro. Replacement Kill Switch Cord for Pro Design ATV Kill Switches. 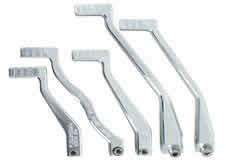 Super stiff replacement lever improves overall shift feel and puts an end to shifter breakages. Machined from 7071 alloy.